I personally like World War II depictions in cinema and literature, and it came as no surprise why I enjoyed the iBomber experience on my iPhone. This iPhone game put me right there in the action, and although I liked FPS games more, my role as a Word War II bomber suited me just fine thanks to the easy controls and fast-paced game play. 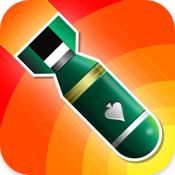 iBomber is one iPhone game you're bound to pick up and forget to put down. You can control your bomber using only your iPhone's touch screen and the accelerometer. There are no virtual sticks or directional pads, no complicated key combinations. Just drop bombs like you've got a whole bag of them from Santa. And actually you do. 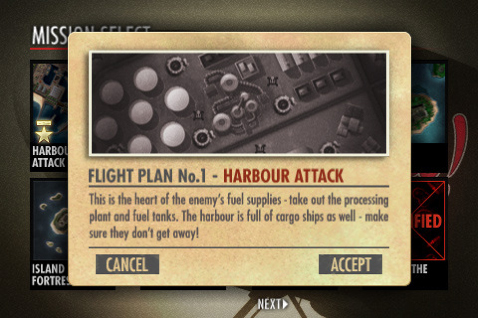 In iBomber you can't run out of ammo, which is a cool thing, and one less detail to worry about. iBomber is focused on you experience in-game, and were it not for the in-between mission briefings, short as they are, you really wouldn't have am opportunity, or a reason for that matter, to put it down. In iBomber, the entire game screen is your bomb sight - talk about a neat interface: one big ol' crosshair. The view is from the top of the battlefield, and your targets are enemy battleships, aircraft carriers, subs, airstrips, oil tankers, gun turrets and pretty much anything that moves, is not sea or rock. Your crosshair will show you where the bomb needs to land and it's up to you to hit the giant red button that says "Bombs Away" and away they go. Also, be prepared to take into account the speed at which you're moving to account for the delay and bomb drop zone. To slow down your bomber, tilt the iPhone back. To accelerate, tilt it forward. Although I didn't really have much of thing for these type of controls, because they impair your vision when you tilt back and forth, but with iBomber more than comfortable screen area, I was satisfied with speeding up or down, or moving left or right for that matter. As you probably guessed, you can do that by tilting your iPhone in the desired direction. Be careful with slowing down though, because enemy turrets down below will target you easier and take enough damage without finding those repair icons will mean you're out of the War. iBomber is spread across multiple levels (12 from what I hear, I only got to level 7 so far), each has its own objectives to complete. Completing them all completes your current level and you advance to the next. The big plus for iBomber here is that there is a good variety of level design, different objectives and there is no real-estate being recycled. Every level is different, so it really feels like another mission. All levels will involve blowing stuff up, but occasionally you'll be asked to be more targeted in your approach. One of the levels had me keeping a friendly in one piece until they reach safe heaven, and that involved a lot of speeding up, slowing down to hit specific targets that were more threatening to it. It's not one of you iPhone strategy games, but it will require you make some decisions as to what to go after first. Successfully completing objectives will open up powerups after each mission. You'll be able to use different kinds of bombs: a mortar bomb that's basically three bombs all at once or the Grand Slam bomb, which you might guess - big impact radius, huge boom. You're not only looking at weapon upgrades, but also health packs so you don't go down in flames. All these are limited and may pop up when you hit specific targets on the battle field. The game was released almost a year ago, and I must say I'm sorry I didn't get around to downloading it sooner. It is still very much playable today though. iBomber is free to download in the AppStore. And let's face it. Who here doesn't like blowing things up? With this level of design and artistic sounds, iBomber for the iPhone can't let you down. What do you think of iBomber for the iPhone? Scroll down for our comment section and let us know! ibomber (factory farm) where is the enemy ship?